Kerala Tourism unleashed its boldest ever campaign in a slick and sly event in London just the other day. The 03:00 min essay is refreshingly different from the routine 'backwater, beach and greenery' themes Kerala Tourism has been successfully flaunting all these years. Keeping the same strengths alive, but experimenting with a new artistically translucent line, KT has adopted a bold, unorthodox but clever step which has won accolades but raising a few eyebrows on its way. Here is how to blow your trumpet, or here, beating your drums in a different way. The film opens with a silhouette of a fisherman-figure evolving himself out from a very well blended waterscape, surely shot in or around the Thakkady catchment area. The short essay passes through moments of tranquility when the female protagonist (Swedish model Miriam Ilorah) soothes herself in Ayurveda and wakes up in a surrealistically quaint highland background. She trods down a narrow, offbeaten country-passage crossing a mature frame of an unadorned, performing Kathakali artist before the mundane caricature of Kerala backwaters bring familiarity to the proceedings. Not before the tourist indulges in some theatrical soul-searching in a typically Malabar-esque plateau and amongst a platoon of Theyyam forms, winding up at ridiculous ease against the calmingly reassuring mightiness of Kerala's State animal. Director Prakash Varma has poetized it all in a dream-form, breaking into lazy-rolling but robust, vivid frames and seems vaguely inspired by Ashes and snow experience. The bold, new style of showcasing the cliched beauty of the state has taken a few aback because of an apparent juxtaposition with the stereotypical image of India. The ad does not physically concentrate on Fort Cochin, Kovalam, Munnar or Kumarakom but on the most potent, untold and enigmatic asset among our rich possessions: culture and diversity. 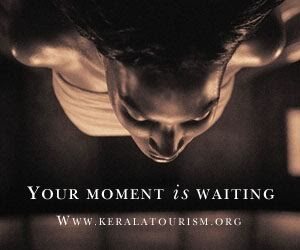 Kerala Tourism's international campaign, Your Moment Is Waiting is a film that goes far beyond the realm of a commercial, to capture the soul of Kerala like no destination hitherto has. Stark Communications, the brain behind this theme and Kerala Tourism's many older campaigns adds on to the tagline. Let's take you to a land, raw and refined, flowing slowly, languorously, sensual and spiritual, stirring memory with desire, the real with the surreal. Don't be surprised if something deep inside tells you that your moment is waiting out here in Kerala, God's own country. Dr. V. Venu, Secretary, Kerala Tourism is more clear about what they intend to propagate. We are trying to be different from others by saying pretty pictures don't make a destination, but experiences make a destination. NatGeo did an interesting study a few years back on 'what lures you to visit a place'. The study fetched up pretty interesting details, the culture and heritage of a place being a major element. Kovalam, Cochin or Kumarakom is not going to lose any charm just because the new ad ignores the picture-postcard scenarios. It has a message that Kerala has much more to offer than just a beach or a backwater haven or a mountain resort. It urges the visitors of 'feel' the state and experience it rather than merely 'visualizing' it. 'Your moment is waiting' has been specifically designed for a target population. Those intended to dig a bit more deep than just the tranquility of resorts. The West has a different way in seeing things. The same reason why our Kathakali, Theyyam and other art forms catch their imagination more than ours. The promo aims to attract a new segment of visitors possibly those from the business end of things. This has always been the idea ever since the think-tanks drafted our Tourism policy. Concentrate on quality of the incoming tourist than the quantity. Appreciable that KT still believes on the 'quality' adjective. The message is quite clear. Kerala is infinitely different from the run-of-the-mill destinations and depicts itself as something much more than a just a getaway. Now isn't this an angle we always lacked? Though Kathakali and other cultural forms were erratically and weakly featured before, I doubt if it ever succeeded to create an impact before this one. I believe that's the idea behind 'your moment is waiting'. And it's always good to look at ourselves in a different angle, and I like this one. Respect to whoever made this, knowing very well there'd be a few brickbats around. Prakash Varma sure has succeeded in catching the attention. It's surreal and packs a punch. The critics remain ambiguous, noteworthy ones that of Tharoor's. Tharoor feels the ad was a bit 'odd' that it fails to showcase our greenery, waters, people and dances. But the intelligent t traveller knows about Kerala, its greenery, its backwaters and all. Google for 'Kerala' and what you get to see what the world see about us. Nobody lands here by accident. A tourist perhaps knows more about us than we could ever imagine. We have more than enough on www capturing our beaches and backwaters, and this advertisement is just another but unique addendum to those luxurious array of magnificent promo materials. And I'd bet this one will take the cake as well. I don't think a potential traveller will hold back saying "Oh, there is no Chinese nets and the swaying coconut trees in this Kerala video." Because for the visiting masses the Infosys 'ship' in Trivandrum or the Le Cochin Meredian is not what they eagerly look forward to. This ad may slightly galvanize the 'sadhu' , 'mystic' and 'snake-charmer' Indian stereotypes but I believe that's what sells where we want to sell it. Surely Kerala has in it to clinically fumigate the down-trodden Indian images. Creating another Mohiniyattom-Kumarakom- Munnar tea garden- Eve's beach video wouldn't be appealing, magnetic or raise any more curiosity. People forget it as soon as the video ends. And how ingenious to premiere the video during the 'Eat, pray, love' movie which incidentally resonates the spiritual and emotional angles of life. The criticisms are also aimed at the artistically unreal colours featured in the video. It must've been a painful creation experience for the cinematographer and director to take out the rich natural colours of the state to focus on the theme they intend to propagate. It's difficult to corelate to the background music as well, especially towards the end, it was more like a Zulu war cry rather than any folklore music I've heard. But it just shakes you up to see our home in a way we never dared to see. Jolt! An advertisement must be able to sell the product, and this one sure seems poised to sell big!